Enter India’s crowded commercial capital of Mumbai (also known as Bombay), and the Goan footprint is writ large — if not-so-visible till you start looking for it. From Goan “joints” at Dhobitalao (originally a washerman’s lake), to the quadrangles of Byculla, Mazagon, Grant Road or Colaba, and beyond. Football at Cooperage and Goan food at Ballard Estate all exported the Goan way of life to that city, which today has a population of 20 million. A new book on the subject seeks to capture the essence of it all, as it played out in the 20th century. It tells the story of the alpha world city and the wealthiest urban centre of India through the words of over two-and-half dozen Goans who lived there in this era. We learn of the lives of prominent Goans such as police chief and ambassador Julio Ribeiro and urban planner Edgar Ribeiro, writer George Menezes, nightingale Lorna Cordeiro, and the author Victor Rangel-Ribeiro. But from the words of the average ‘Bomoicar’ also emerge a fascinating story of the simpler life in the city and a depiction of its times. in past decades Martins narrates her own story of arriving in Mumbai in the thick of the 1992 communal violence, and then goes back to the Bombay Goan world of the 1940s in Bandra, the “aunties” and the kudds (village clubs where migrants from Goa resided). Through the stories she took years to carefully collect, she zips through Goan theatre or tiatr in Bombay (as the city was then called), and musicians there. The book has two Goan musical greats — Lata Mangueshkar and Anthony Gonsalves — on its cover. In the 31 pithy essays that follow, contributors talk about the “city of light”, summer holidays in Goa, living in the kudds, matchmaking, romance, fairs and festivals, and educational forays in the big city (from boyhood years at St Stanislaus to almost getting thrown out of a technical radio officers’ school as described by Floriano Lobo of Moira). One of the most touching stories is by Canada-based Roland Francis, who describes an elderly impoverished Anglo-Indian lady known as “Cotton Mary”, her serenading and the changing times of the Anglo Indian world in Bombay, as it related to the Goan there. Cynthia Gomes-James talks about the profs at a prominent Catholic institution in Bombay, St Xavier’s College. Elsewhere in the book, she also describes the festivities around the arrival of Our Lady’s statue to Goan homes there. Chef Masci, the Bombay steamer, cinemas, restaurants and moneylenders, bangdda-curry rice, the Bandra Fair, the Chris Perry-Lorna magic, and Goa-India economic blockade days are the other individuals, institutions and events remembered in this book. 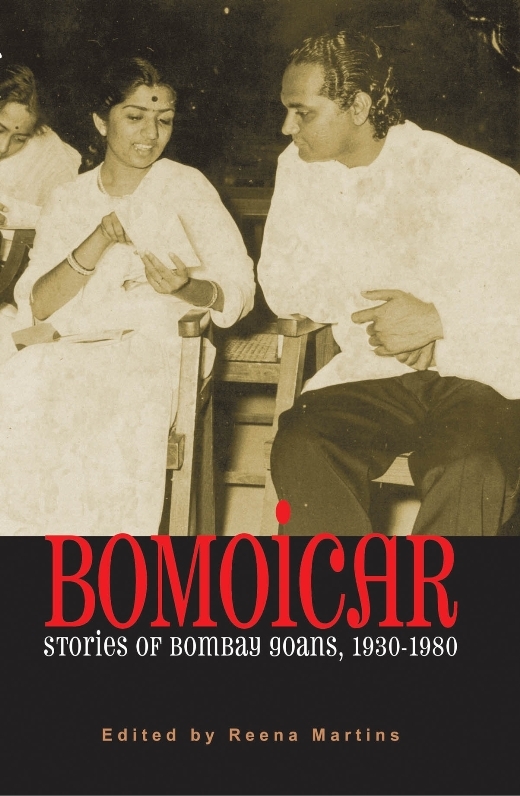 Martins, who edited, compiled and conceptualised the book, calls herself a Bomoicar and the book she has just edited and compiled is titled similarly. Stories of Mumbai Goans. From Mid-Day. Goan connection: Time-Out talks to Reena Martins about Bomoicar. The Goan Aunty: excerpt in The Navhind Times.